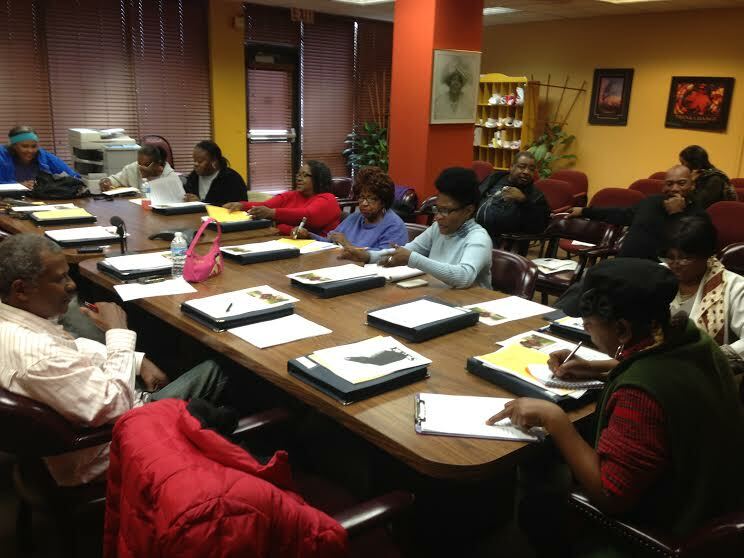 The Central Advisory Council, the elected leadership of the residents of the Chicago Housing Authority, recently announced the result of its recent election. Pictured here are the following: Francine Washington (bottom right corner, identifications are from right), president of the Washington Park Local Advisory Council and chairman of the Central Advisory Council; Perry Casey, president of the Senior North LAC; Mildred Pagan (off camera), president of the Lathrop LAC; Charmeita Witherspoon (off camera), president of the Lawndale Gardens LAC; Shashak Levi (off camera), president at large of the Robert Taylor ‘B’ LAC; Carole Steele, president of the Cabrini-Green LAC and vice chair of the CAC; Natalie Saffold, president at large of the Leclaire Courts LAC; Charnae Harmon, president of the Henry Horner Homes LAC; Rosemary Coleman, president of the Senior Central LAC; Pauline Wesley, president of the Senior South LAC; Myra King, president of the Trumbull-Lowden LAC; and Beatrice Harris, president of the Wentworth Gardens LAC. Not pictured: Carol Wallace, president of the Dearborn Homes LAC; Bernadette Williams, president of the Altgeld Gardens LAC; Maria Sopena, president of the Northeast Scattered Site LAC; Annie Davis, president of the ABLA LAC; Maner Jean Wiley, president of the Hilliard Homes LAC; Claudice Ware, president at large of the Ida B. Wells LAC; Mary Baldwin, president at large of the Rockwell Gardens LAC; Mildred Dennis, president at large of the Robert Taylor ‘B’ LAC. Enter Survey, Win a Laptop Computer! We The People Media is asking people to fill out an on-line survey we developed with the Local Advisory Council resident leaders. Anyone that fills it out gets the chance to win a laptop computer or a gift card! Click here to listen to We The People Media’s Executive Director Ethan Michaeli on WBEZ Chicago Public Radio’s new hit show “The Afternoon Shift” with Steve Edwards talking about the Chicago Housing Authority’s efforts to revise its Plan for Transformation. Ethan and Steve examine the pitfalls as well as the opportunities of creating a new paradigm for public housing for Mayor Rahm Emanuel and the City of Chicago. Ethan speaks during the second hour of the program. 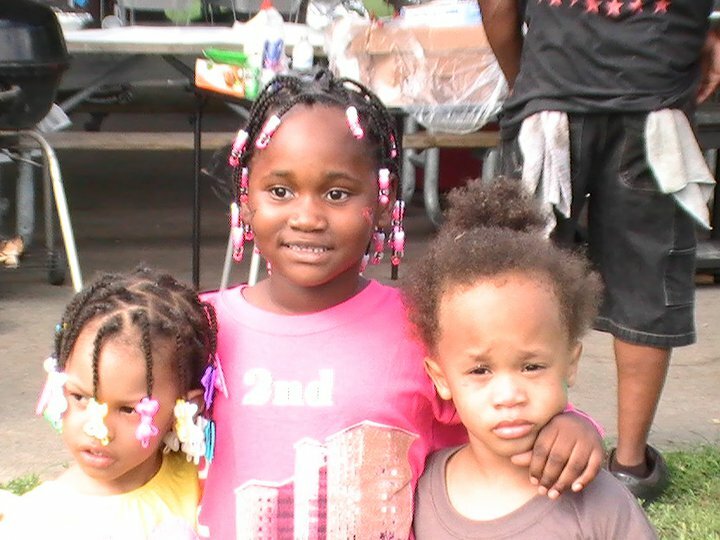 Young people at the recent reunion for tenants of 5135 S. Federal St., one of the buildings in the now-demolished Robert Taylor Homes development. The reunion was held August 7 in the Dan Ryan Woods. Photo by Marsha Muhammad. Five years after the last building in the Robert Taylor Homes was demolished, it’s a miracle to locate former residents not only from that development but from anywhere in the Chicago Housing Authority. After years of being displaced by gentrification, we were united on a social network site named Facebook. The best of my former neighbors at Robert Taylor are doing just fine. It may surprise many to see that we are functional people, since we were deemed dysfunctional and self-destructive. But we are alive and still standing! Still standing literally and figuratively. Moving out of public housing became a challenge to the majority of former residents. Many families were disenfranchised by a welfare system that cut off their resources if they found employment that increased their income a penny over the poverty level. Residents learned how to survive by manipulating the system. Do just enough to not go homeless and live comfortable, but not enough to move out into the private sector and pay market rent. These residents outnumbered the working-class residents that paid market rent. This system bred generations of families who were taught the same cycle of survival. People rarely moved out. Perhaps the “Hole” should have been the nickname for the entire development. Robert Taylor Homes still exists – on the Internet. The last building in the Robert Taylor public housing development was demolished in 2006. Just a few dozen replacement units have been built, and most of the hundreds of thousands of people who lived in Robert Taylor’s high-rises over the decades have scattered all over the globe. Editor’s Note: The following article was written by a youth reporter who is a graduate of the Urban Youth International Journalism Program. The Robert Taylor Homes, a South Side public housing complex where 27,000 people once lived on 92 acres, was a place where many people had life experiences. Its 4,300 units were home to residents who all were hurt when it was destroyed. Now, the Robert Taylor Homes are nothing more than a book of memories—just a pile of dirt, bricks and cement. Since the Robert Taylor Homes are gone, the once-drawn-together residents have scattered all over Chicago. Some even went to live in the suburbs. Janice Patton gave up on the Plan for Transformation a long time ago. Patton moved out of Robert Taylor Homes in 2000, the same year Mayor Richard M. Daley announced the Plan. The mayor promised that residents who moved out temporarily could return shortly, after the high-rises were demolished and replaced with new, ‘mixed-income’ communities. Patton didn’t go too far from Robert Taylor, settling in the neighborhood just south of where the development stood. Like most of those who moved out, she used a Section 8 certificate – now known as Housing Choice Voucher – to subsidize her rent in a relatively well-managed, new construction development. Unlike many of her former neighbors, Patton never expected to come back.